Recent political uncertainty has seen this year’s best-performing currency depreciate heavily this week as Mexico’s left party showed a sizeable lead in Mexican elections. Andres Manuel Lopez Obrador opened up a 21-point lead in this week’s poll. Lopez Obrador leads the second-place contender Ricardo Anaya by a considerable margin and could be set to extend the lead after this weekend’s live debate in Mexico. Andres Manuel Lopez Obrador or AMLO as he is often referred to, began his political career in 1976 with the PRI party, a member of the city of Tabasco he eventually becomes state leader. In 1989 he subsequently left and joined the PRD party. In 2014 AMLO decided to form his own party the National Regeneration Movement of MORENA which he led until this year, before joining the coalition of right and left-wing party Juntos Haremos Historia. The party’s manifesto has proved very popular, with the Juntos Haremos Historia calling for more social spending, a limit on foreign company’s involvement in the Mexican energy sector. The Frontrunner AMLO is also calling for a 3-year freeze on fuel prices which have proved popular as prices have spiralled in recent years. Lopez Obrador is also looking at putting an end to or at least improving rife Mexican corruption. His plans on corruption include improving crooked institutions and government corruption. AMLO has also proved popular due to his love of his nation as he is keen on Mexican sovereignty, with many calling him Mexico’s answer to Donald Trump. Mexico’s current energy minister has rejected AMLO’s suggestion to fix fuel rates for three years, stating he thinks it’s not the best solution. Whilst other ministers have called his fuel price fixing process unpredictable. Over the last few years, Mexico ended the process of government fixed oil prices which have seen gasoline prices skyrocket. NAFTA talks reconvene in the next few weeks and although this might just be another flippant Trump comment it certainly could throw another spanner in the works. All negotiating parties are believed to conclude the agreement before another president comes to power, avoiding any potential destabilisation. Whilst for a long time the AMLO has been considered the front-runner to be the new Mexican president the scale of his lead has surprised markets, especially so early in the election process. 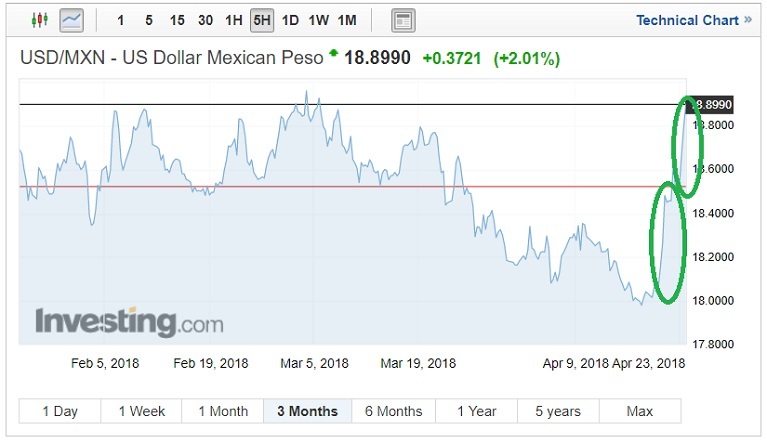 The start of the year had been kind to the Mexican peso, fuelled by a potentially more positive NAFTA outcome and assisted by a weakening USD the peso has gained over 8% since the beginning of 2018. However, the tail end of last week saw the Peso collapse losing 2% on Thursday with losses continuing on Friday. The USD-MXN currency pair has fallen as low as 17.9814 in recent weeks but has appreciated enormously following AMLO’s considerable lead. Currently, the pair sits at 18.8990 with more USD gains likely. The pair accelerated further on Trumps recent NAFTA tweet on Mexico’s border security, with the president apparently now wanting to make it one of the agreement’s conditions. It’s understood that investors have been selling off this year’s best performing currency due to Lopez Obrador’s manifesto on the energy sector. The fear is that he could unravel a lot of the positive work that has taken place in the sector, the improvements making Mexico much more productive and modernising the economy.